In keeping with the back to school theme Ecoist has done it again!! This super cute notepad is great for a student of any age. This is the perfect accessory for you eco-savvy people who prefer to be environmentally-adorable! The pad is made from recycled newspaper and covered with a natural laminate that is handmade by a Brazilian Fair Trade Co-op. The Notepad is only $10.00, which is extremely affordable, so there is no excuse why everyone shouldn’t have one! The slim pad can fit into many sized book bags, briefcases and even handbags! Wouldn’t you rather whip out this eco-awesome notepad instead of the same-old boring not environmentally friendly notebooks that have been sold for decades? Back to school season is finally on! 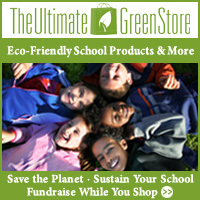 School is a great time to get your children involved in the green movement. They have a chance to be an example to other students and faculty. Environmentally friendly products are no longer drab and boring. You can purchase excellent quality items that look just as cool as the rest of the back to school items sold at every store this time of year. You and your child have a chance to positively impact the impressionable individuals your children interact with everyday! 1. The EcoStapler- There is no need to remove metal staples before shredding or recycling your documents. The eco-friendly, staple-free stapler can fasten up to 5 sheets of conventional paper together and is incredibly easy to use. It’s a great & safe for children. 2. Banana Paper Recycled Binder Filler – This 100-sheet pack of sustainable, Binder Filler Banana Paper is bleach-free, acid-free, and made from 80% post-consumer waste paper and 20% banana leaf fibers. The paper is 3-hole punched, measures 10.5″ x 8″ and is available in either College Ruled or Wide Ruled sheets. 3. Terracycle Frito-Lay Wrapper Binder- This durable Frito-Lay binder by TerraCycle keep papers in place with a 3-ring binder and easily wipes clean with the swipe of a damp sponge. The binder is made out of used chip bags that could not be recycled but are remade into a functional and creative product. The used chip bags are washed and sanitized before the product is sewn to ensure the cleanliness of this product. 4. Green Apple Eco-Friendly Highlighter Pencils – These biodegradable highlighter pencils are jumbo-sized and feature a hexagonal shape and natural wood finish. They come in a 4 pack of assorted colors and will not smear ink or bleed through textbooks or dictionaries. 5. TreeSmart Biodegradable Ruler & Recycled Pencil Set- The biodegradable green plastic ruler (12 inches) holds two TreeSmart Recycled Newspaper Pencils along with an eraser & pencil sharper (all included). 6. TreeSmart Recycled Pens- Made from a combination of biodegradable plastic, bamboo, and recycled paper, the TreeSmart Pen is writing its way to a greener future for everyone. Your one-stop green shopping destination for home,office and everyone in the family! The EcoZoo Kids Backpack line by EcoGear is a cute and convenient way to carry your things around in earth-friendly style. A bag for kids of all ages, the EcoZoo Kids Puppy Backpack is ideal for school, overnight, and every-day use. From domestic to exotic breeds, these are the most charming creatures to ever appear in the form of a bag. This PVC-free bag is made from organic cotton canvas and rope materials. The buttons and buckles on this bag are made from recycled plastic parts and sustainable wood parts. All colored materials used in the construction of this bag are treated with toxic-free dyes. There are durable internal pockets for storage that securely fasten shut with a hook-and-loop closure. There is a top web loop for hanging and two padded shoulder straps for the wearer’s convenience. EcoZoo bags are also available in Panda, Pig, and Elephant styles. October’s Green Business Product Pick is…..
October’s Green Business Product Pick is the ReMARK by <a href=”http://www.shareasale.com/r.cfm?b=191710&u=373682&m=24028&urllink=&afftrack=”>ReBinder</a>!!! Now stock your office with green writing implements. ReMark pens contain no petroleum plastic. <a href=”http://www.shareasale.com/r.cfm?b=191710&u=373682&m=24028&urllink=&afftrack=”>ReBinder’s</a> ReMark look and feel like plastic but they are made out of plant resins from sustainably harvested wood and organic cotton. Send them back to The Sustainable Group and they will “upcycle” the pens to make new ones!!!! It’s the small things that can make a big difference. It can take time to make a change but starting small is a better start than none at all. Making your office greener may seem difficult to begin but with ReBinder Sample Pack! you can make your office a greener and more environmentally conscious place to work. Remember, everyone has to start somewhere. It takes time to change your life but with steps so easily available it only makes sense to jump at the chance! The ReBinder Sample Pack! gives you the perfect starter kit that each employee can use to begin their green office arsenal. RePocket: Our two pocket folder is ideal for presentations, media and press kits or back to school. RePockets are thicker and more rigid than traditional folders. Made from 100% Recycled 20 point FSC Certified bending chipboard. 1″ ReBinder! The original 3 Ring Binder with a removable and recyclable cover. Made from rigid recycled corrugated cardboard, our 1 inch ReBinder! is the binder choice for every day use around the office, as well as a by top architects, graphic designers and creative agencies. Your presentation and image will stand out from the rest when you present in a RePouch — (IN THE 1″ BINDER): When your proposal requires an additional pocket, CD and or business card, RePouch fulfills all those requirements. Made from 20 point recycled bending chipboard, it holds up to continuous page turning. ReTab — (5 TAB Dividers): Divide your documents with our rigid brown ReTabs. ReTabs are made from rigid 18 point FSC Certified bending chipboard in a five-cut tab configuration. We also carry an eight-tab version (not included in the sample pack). 1.5″ ReBinder! Rougher and tougher, our 1.5″ ReBinder! is made from 100 point solid FSC Certified recycled chipboard and contains our unique removable ring metal assembly. Just because it’s not made of plastic, doesn’t mean that it’s not durable! ReSleeve: A Recycled CD jewel case…making plastic cases a thing of the past. ReSleeves are made from 16 point rigid FSC Certified bending chipboard to protect your CD/DVD . The perfect off the shelf solution for the software company, the music label, the band or the board room. Show off the artwork on your CD through the open hole in the front…or choose the version with no hole. RePlay: Ideal for one disc or two, RePlay comes with two open pockets that fit a single disc and a small booklet or two discs. Looks like a traditional jewel case but made from 18 point recycled FSC Certified bending chipboard. You’ll want to replace all your broken plastic jewel cases with a RePlay. ReBadge: Trade shows, Conferences, and Seminars all produce a lot of waste. Green up your event with a ReBadge. Your attendees won’t believe that their badge is made from plants and not from plastic! We hope you’ll reuse your ReBadge multiple times, but if you can’t — compost it! Comes with a sample our 100% recycled perforated brown cardstock. ReWrite mini — LINED: We’ve created the perfect sized 5″ x 8″recycled notebook for taking notes, sketching or doodling. Our ReWrite mini comes with 40 pages of 100% Recycled / FSC Certified paper and a recycled FSC Certified bending chipboard cover. You’ll get a sample of our most popular college ruled (lined) version but our ReWrite are available in case quantities in ruled, blank or quad ruled graph paper. ReBound: Make your presentation a game winner — go for the ReBound. Document Finishing supplies have been limited to plastic and non recycled paper options. ReBound’s clear cover looks, feels and performs like plastic but it’s made from plants! ReBound can be used with any comb or coil binding system and comes with a clear PLA cover and a 20 point recycled FSC Certified chipboard back. It’s the perfect solution for proposals or LEED proposals. *ReBinder! Chipboard/Bending Chip: 100% Recycled / Minimum of 85% Post Consumer Recycled Fibers, FSC Certified and fully recyclable end of life. * ReBinder! Corrugated Cardboard: 70% Recycled (at least 40% Post Consumer Recycled) and fully recyclable end of life. * ReBinder! PLA (Poly Lactic Acid): Clear sheet made from plants, not from plastic. Certified Compostable by ASTM D6400 Standards.